Type Of Trap: Of the many wildlife traps available, it's important to choose the correct one. The trap type and size must match the animal and situation. A small, sensitive cage trap for a squirrel. A large, sturdy cage trap for a raccoon. A swinging door repeater trap for pigeons. A snap trap for rats. Etc. A high-quality trap is important. 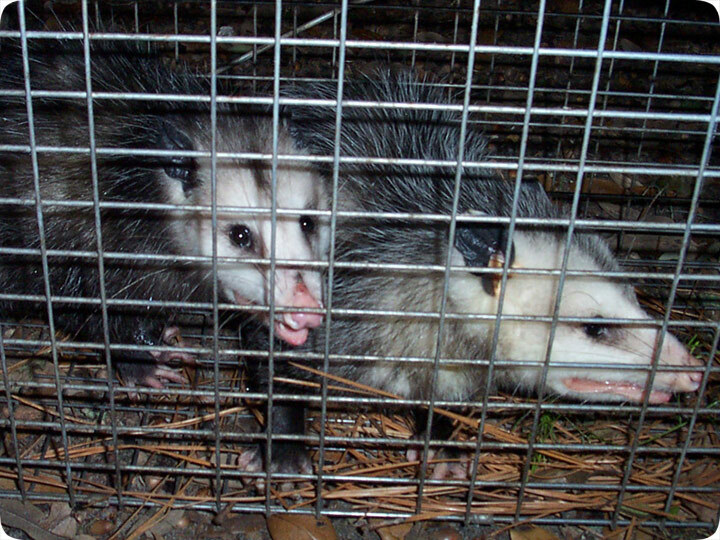 Low quality traps can result in failed catches or escaped animals. Type Of Bait: This factor isn't really very important at all. Most of the time, you can catch the animal with no bait if you do everything else correct. It's simple - for rodents, use nuts and peanut butter, and marshmallows and cat food will suffice for a variety of larger wildlife. Location of Trap: Very important. If it's a groundhog or an armadillo, the trap should be on the hole. A squirrel, on the roof. A rat, on its travel pathways. A raccoon, where it's foraging. Etc. Integrity of Set: This is actually probably the most important element to ensure success, and the area where most people fail. The trap should be flush with the ground. There should be no debris to block the door or the trip pan or any other component. The trip pan should be set at the proper sensitivity. Roof mounted traps should be bolted in with shingle protectors. Repeater traps must have no alternative routes of escape. Etc. Safety: The traps should be set so that the trapped animal is not exposed to the sun, or else it will overheat. The trap should be clear of electrical wires or anything else you don't want a raccoon to reach out and destroy. It should not be a lethal trap that can kill the neighbor's cat. It should not be set where kids can stick their fingers inside and get bitten. Etc. I never harm or kill the animals that I trap. A lot of experience is necessary to make sure that the whole process goes smoothly. Also, it's illegal for unlicensed persons to trap animals in most states. I definitely believe that animal trapping is best left to competent professionals. It may seem simple, but most attempts I see made by beginners fail for a variety of reasons. Do it yourself: Visit my How To Trap Animals Yourself page for tips and advice.